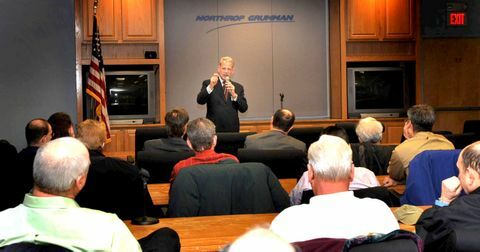 BETHPAGE, N.Y., Jan. 12, 2010 -- Representative Steve Israel (D-N.Y.) met today with Northrop Grumman Corporation (NYSE:NOC) employees and the leadership of the company's Battle Management and Engagement Systems division at its Bethpage, N.Y., facility. Israel, a member House Appropriations Committee and the Select Intelligence Oversight Panel among his many Congressional assignments, discussed the company's local operations and programs, its impact to the Long Island economy, and his own initiatives as they will help the greater Long Island community. He briefed employees on his fact-finding visit to Afghanistan. "When I was on the deck of the USS Nimitz I saw firsthand how Long Islanders have strengthened our economy while answering the call of this nation," Rep. Israel said to a group of employees as he discussed his recent fact-finding trip to Afghanistan. "We're working every day here on Long Island to build and design systems that will protect those who are serving and defending us. I am here to thank you for the contributions that you have made in keeping our Armed Forces and our nation more safe and secure." Northrop Grumman Battle Management and Engagement Systems vice president Tom Vice and his deputy, vice president Patricia McMahon, updated Israel regarding the company's programs and the many Long Island subcontractors supported here. Programs include the E-2D Advanced Hawkeye, and Broad Area Maritime Surveillance aircraft production and development programs, the KC-45 Tanker program, and the Bethpage site's portfolio of airborne electronic attack and mine countermeasures sensor systems. They also discussed the Northrop Grumman's community involvement, including the company's unique Operation IMPACT (Injured Military Pursuing Assisted Career Transition) hiring program, which earned the company the "2009 VetSuccess Private Employer of the Year Award;" its environmental campaign to cut energy use and reduce the site's carbon footprint; and the Bethpage site's advanced research into new technologies for energy independence applicable to both military and civilian use. "The congressman has a deep commitment to the security of the nation reflected in his previous role on the House Armed Services committee and his current assignments. This visit was part of his continuing effort to stay current on what the military and the industry that supports them are doing, as well as what is required for them to succeed," said Vice. "It was also a great opportunity for Northrop Grumman to update him on the company here on Long Island. Our programs are extremely complex technologically. They are staffed by large numbers of very highly trained and skilled people who make significant contributions to their home communities and the larger Long Island economy," Vice said. "Though the company has seen many changes in the 80 years it's been on Long Island, our employees continue the legacy of Long Island defense industry leadership here and have positioned us for many more years in that same role."